What is a city? How is it constituted? What are its functions? How is it to be governed? Who are its citizens? What should it look like? In the 18th century European and, in particular, French intellectuals proposed novel formulations of such questions and offered a wealth of competing arguments, radically changing the practice of urban planning and ultimately redefining the very idea of the city. 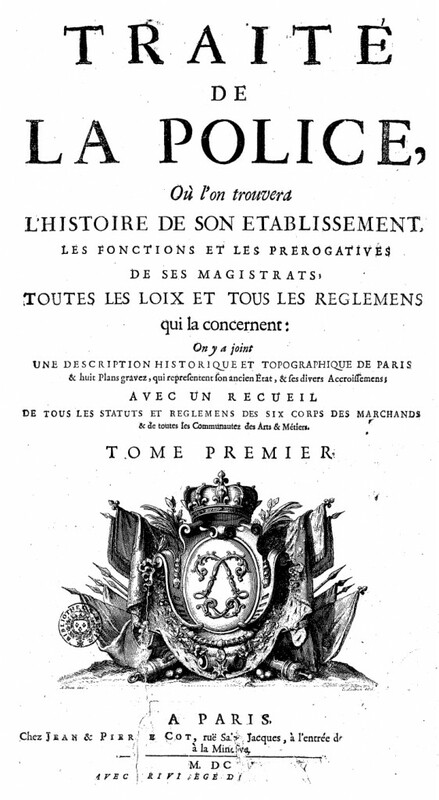 The seminar will explore a series of historical transformations in the way the city was problematized in ancien régime France by discussing both a series of administrative and juridical practices developed to manage the city of Paris, and a corpus of texts produced, from the end of the 17th century until the Revolution, under the rubric of “police science.” Such analysis will help us revisit some of the basic assumptions in the study of the city of Enlightenment (e.g., the very notions of Enlightenment, rationality, order) and consider anew the longstanding question of the relationship between architecture and society. Arlette Farge, “Police,” in Encyclopedia of the Enlightenment, ed. Michel Delon, trans. Philip Stewart and Gwen Wells (Chicago: Fitzroy Dearborn, 2001): 2:1063-69. Michel Foucault, “April 5, 1978,” in Security, Territory, Population: Lectures at the Collège de France, 1977-78, ed. Michel Senellart, trans. Graham Burchell (Houndmill: Palgrave Macmillan, 2007): 333-61.